I am more and more drinking only rums promising no additives. Some of these are the product of ageing in wood other than ex-bourbon, but the wood is dry. There is no mixing of spirits only the influence of their past presence in the wood. I am trying not to be a snob about this. There are still a few rums having a just a little added sugar (English Harbour) or more (El Dorado 15), or maybe a little sherry (Dos Maderas 5+5), that I still like very much. At least I think I would when I get around to having them again. But more and more there are really good rums with no additives available on the American market, and I can only drink and afford so much. The last ingredient here is a new up-scale brick and mortar store Bitters & Bottles but 10 minutes drive from my home with a spectacular rum (and both whiskeys and whiskies) collection. Consequently, in the last year I’ve bought nothing but these rums from a half-dozen producers, but in particular from Foursquare and Hamilton (many reviews of both lines here). Even now, buying these for a year, there are a few of each producer sitting in my closet not yet tried. There have come to be so many of them. Yet even among these, perhaps one or two dozen producers out of many hundreds available available in the U.S. there is a huge range of effects and it is good to keep reminding yourself of how much different two rums can be. I found this recently no better illustrated than the difference between the Foursquare PREMISE I reviewed last time and this Worth Park. The PREMISE smacks of sweetness and fresh fruit, although no sugar is added to it. It is aged for 10 years both in ex-bourbon and ex-dry-sherry casks, and comes to us at 46% ABV. 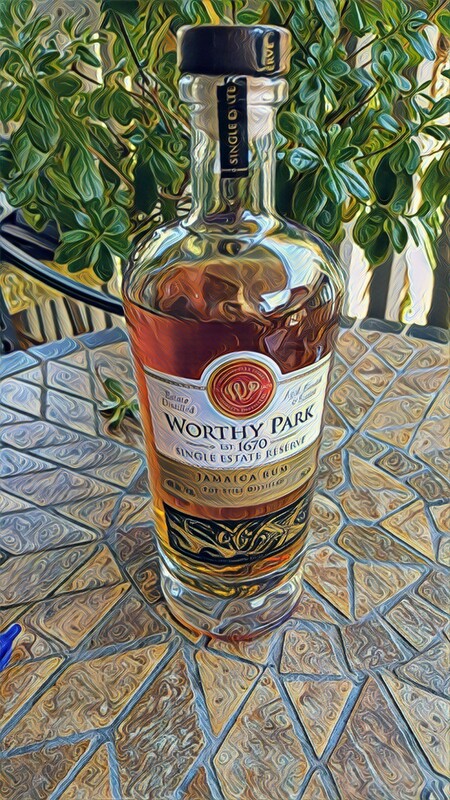 The Worthy Park is dry with notes of over-ripe fruit, aged 6-10 years (according to the label) in “once used” ex-bourbon casks, bottled at 45%. But their aromas and flavors could not be more different. I’m guessing, but I suspect the casks are not charred and come from a non-smokey sort of bourbon. There are no charred oak flavors. The bottle shape stands out a bit. There is a nice synthetic cork stopper. Let’s look at the rum. Color: Pale amber, light copper. Legs: Thin legs, fast at first, slow down as they go. Nose: Ripe dark fruit, deep molasses, alcohol, ripe banana, caramel toffee, coffee. A very rich nose with a promise of Jamaican funk like a Pusser’s or Appleton Estate. 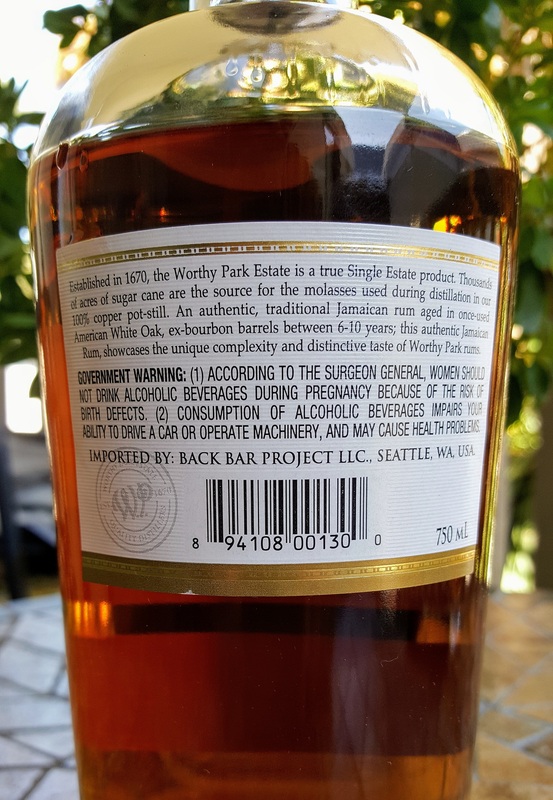 Sip: Crisp, thin body, clear, some fire in a medium slightly bitter finish, dry, thin body, and only the slightest hint of over-ripe ester funk to remind you this is a Jamaican rum. A very clear dry rum. That’s amazing. Given how much ester seems to be present on the nose, the taste has only the slightest (though unmistakeable) hint of it. As I finish the glass the rum stays crisp. Its body doesn’t seem to thicken up as many do. There is one down side to drinking these. They do tend to be pricey. This Worthy Park was $60, a little steep for me, but it did come highly recommended, I can see why. 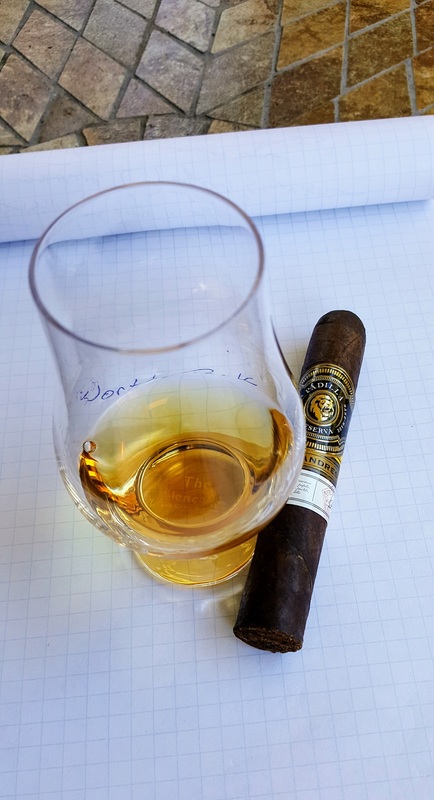 As goes cigar pairing (the cigar pictured is the last of my Padilla San Andres Reserva, I haven’t found any combination yet as good as everything seems to be with the Premise. But this is a great rum and a great counterpoint to sweeter offerings if you are in the mood for a change.